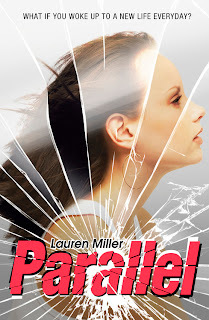 Although I didn’t know a great deal about ‘Parallel’ by Lauren Miller before I started reading I was sold by the claim on the cover that it’s ‘Sliding Doors meets The Time Traveler’s Wife’. Those are both amongst my favourites and in general I love time slip/time travel stories, so it seemed like an easy win. I was still unprepared for just how much I would love this book though. The premise is that Abby Barnes, a super focused high school senior finds herself on a completely different path to the one she’d anticipated, and all as a result of having to change one of her lessons to a drama class. Of course things are about to get far more complicated once the day after her eighteenth birthday Abby wakes up in a university dorm in another part of the country and no idea how she got there…Abby soon discovers she is living a parallel version of her life, which changes every time her ‘other’ self makes a decision. Each chapter alternates between the two Abby’s who are a year apart, one is in her last year of high school, the other her first year at college. I find American high schools and colleges fascinating to read about and it was a nice change to read a YA book set in an Ivy League college. I loved the well-rounded characters in this book, particularly BFF Caitlin and Josh one of the love interests. The characters really seemed to develop throughout the book and not just exist purely to move Abby’s character forward. The complicated nature of the story was handled really well and I didn’t spot any loopholes created to make the story more feasible, it was incredibly well thought out and I found it fascinating. We all know how small events can change the path we find ourselves on but it was really interesting to read about all of the idiosyncrasies that can have an impact on these changes. ‘Parallel’ certainly gave me plenty to think about particularly as a person who likes to plan! It’s a very ambitious debut that really delivers an engrossing and impeccably executed story. The ending was perfect but still left me wanting more. I’d definitely recommend this book to anyone else who is fascinated by the concept of parallel lives and there’s plenty of tension, suspense and romance in the mix.